I love it when an author changes direction completely, and with The Uninvited Guests Sadie Jones has done just that. The results are strangely wonderful. It begins, not unconventionally, in the spring of 1912, at the breakfast table of Sterne, a remote country house. There sit a mother, Charlotte; her three children, Clovis, Emerald and Smudge, and Edward, her second husband and their new and resented step-father. My first impressions suggested that Charlotte was both charming and capable; Edward was both patient and tolerant, Clovis and Emerald were horribly spoilt; and Smudge was a little adrift from the rest of her family. But as the story advanced many of those impressions would be very cleverly shifted. First Edward is set off to town to try to secure the funds that the family desperately need to save their beloved home, and then the rest of the family began to prepare for Emerald’s birthday party that evening. Up to this point The Uninvited Guests looked like a classic country house story. And it was a very well done country house story: the setting and the characters were beautifully drawn; the house was sufficiently isolated to be a world unto itself; and the arrival of guests for Emerald’s party offered some interesting possibilities. But then something happened: a message from the railway that there had been a crash and that a group of survivors must be accommodated until arrangements could be made. 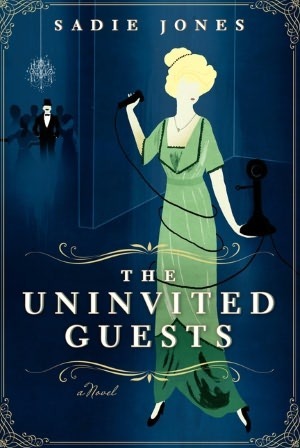 It might sound like an interesting plot development, and indeed it was, but even before those uninvited guests arrived there were also little signs that something not quite right: abrupt messages, telephone calls cut off, a complete lack of explanations. And at that point the story grew into something very strange: a comedy of manners, a ghost story, a fable. and a social satire, all mixed together to create something quite unlike anything I’ve ever read before. A befuddled group of lost souls arrived from the railway and was moved from room to room as the family seems oblivious to the fact that they might need anything more that a space to occupy. They seemed to move as a body, their numbers seemed to grow and grow, and as the night drew in they became more and more of a presence. One man stepped forward from the group. He joined the party, he shook it up, and he made some startling revelations. Charlotte was rattled, and her elder children were left to try to hold things together. But Smudge, quite forgotten by everybody, had been upstairs planning something quite spectacular. And she provided an appropriately dramatic, and moving, finale to the night’s programme of events. In just one night everything changed, and yet when Edward arrived home the next day everything remained the same. I was fascinated, and the story held me from the first page to the last. It held me in the same way that certain books held me as a child when I didn’t quite have the maturity or the experience to fully understand what they had to say, but I still loved them. But I did notice that the changes wrought by the Great War, just a few years in the future, were so very cleverly foreshadowed. And that some telling points were made about Edwardian society. I did love the stylish prose. It was so well matched with the story, and it brought the house, its occupants, and their world to life quite beautifully. And I was intrigued by the human story, particularly by the way my simple first impressions changed as complex characters, unexpected characters, emerged. I was only sorry that the story took a while to get underway and that there wasn’t more space and time for characters to shine and for ideas to percolate. There is much more to be said I’m sure, but all I can think of is the expression strangely wonderful. And the more I think the more that feeling grows. Oh my, I love a book that casts a spell! Having just finished this book only yesterday I can completely understand your review. I am just formulating my review at the moment in my mind, because this is such a different sort of book, it does not follow a pattern that the author has decided to follow in their writing. I loved Smudge, she reminded me of Flavia de Luce in a way and the Great Undertaking was certainly not what I imagined. I wonder what Sadie Jones will come up with next? This is due out here in the US later this spring and I can’t wait to get it. I am already on the list at the library! I hadn’t heard of this book, it sounds great. I’ve put it on my TBR list. You’ve convinced me! I found that Small Wars took awhile for me to sink into as well, but I was quite pleasantly overwhelmed by it after I realized what she was up to. Isn’t it odd how sometimes books that seem to almost defy discussion are, simultaneously, the ones that most strongly inspire you as a reader?! Sounds wonderful. I was looking trhough your blog and the recent books you’d read and this cover really stood out. It’s so intriguing. One to keep an eye out for I think. I’m looking forward to this one after loving her last novel so much. I’m glad to hear I’m in for a treat! You had me at “English country house.” I am fascinated by this setting, mostly due to my love of Agatha Christie and obsession with Downton Abbey. I’ll have to keep my eye on the library lists. Thanks for the review!